The underslung engines kind of reminded be of the Kobayashi Maru from the reboots. I was intrigued by the "hood ornament" at the front of the ship. I wonder if this is a lion, just like the head of the cane used by Stella's father. Actually the nacelles look more like the front end of an ENT Y-class freighter. The similarity is only superficial. 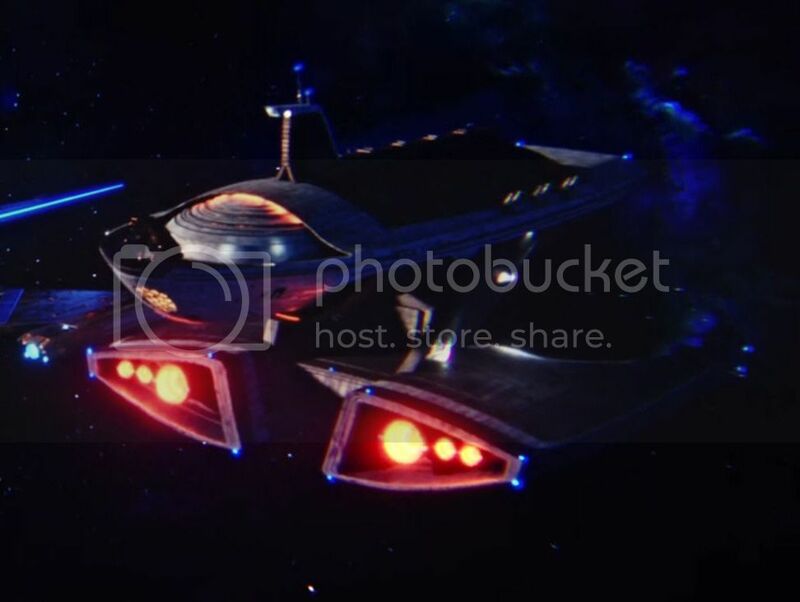 This is definitely a new CG model which does not re-use any actual CG elements from the Galactica. Indeed! I can see a clear design influence there! Did anybody identified the ship classes that docked at that new space station at the beginning of Episode 5? One or two of the Kerala type ships could be Clarke type instead. So the first AMERICAN to, not go into space, but just make a pissant suborbital flight, gets a class named after him - and then one of the ships of said class is the name of the RUSSIAN who was first actual proper man in space? Charming. But entirely fitting for John Eaves. Malachowski: Could be named after assorted Polish politicians or military officers, but probably more likely after Nicole M, a USAF officer. Engle: based on the others, almost certainly Joe Engle, another X-15 pilot and Shuttle astronaut. Hoover: J. Edgar? Herbert? Or probably Bob, noted test pilot. Nimitz: the ship, or the admiral, I guess it's really moot at this point! Cardenas: one of the places? Or there are many, many notable people with it for a surname. Uniquely, none of them are aviators, that I can tell! It's always going to be related to aviation with him. John Eaves confirmed article three hours ago. Bonus points for whoever identifies the living persons, as of today, who’s starships class bears their name. Eaves indicated that there are other new class ships that have not been released yet. Are they really letting Eaves name all the shups & classes? Because this guy has the most narrow-minded outlook & naming convention I've seen outside of zhorlord fanboy types. So all Starfleet classes are named after mostly obscure 20th Century North Americans.So much for diversity. John Eaves on Facebook has the Dana as Hoover-class and the Ride as Shepard-class.